This Michael Kors Christmas Holiday Bough adds a festive “eyebrow” to the designer’s display in keeping with the Season. The backlit Michael Kors brand adds emphasis precisely where you would want it, signaling the best of apparel is here and ready for selection. The gift box atop it all hints that Miachel Kors makes a great gift too. 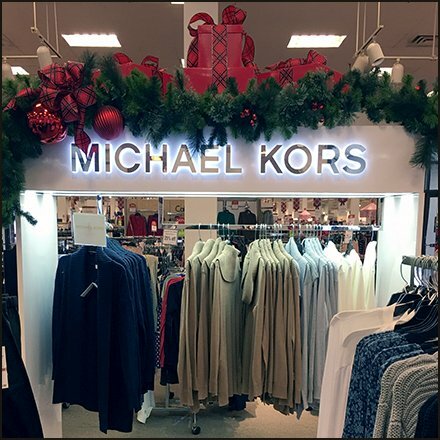 This Michael Kors Christmas Holiday Bough seen at Bon-Ton.